Once you have made the above connections upload the following sketch. The sketch takes anything entered in to the serial monitor and sends it to the Bluetooth module. It also copies anything received from the Bluetooth module to the serial monitor. It also echos the user input in the serial monitor back to the serial monitor main window. To confirm AT commands are working enter “AT” and hit Send. For more details about the AT commands look at the BLK-MD-BC04-B At Command user guide. This entry was posted in Arduino, Bluetooth and tagged HC-05 FC-114, HC-06 FC-114 by Martyn. Bookmark the permalink. In the bluetooth module FC 114, there is an EN pin. What is the use of that pin and where do I connect it with arduino uno . How do I use that bluetooth module in master mode while pairing it with other bluetooth module ( PI 05). Connect the EN pin to GND to disable the module. I don’t have a write up on connecting the FC114 module but have a look at http://www.martyncurrey.com/connecting-2-arduinos-by-bluetooth-using-a-hc-05-and-a-hc-06-pair-bind-and-link/. This should help. Thank you for your quick reply. This would be more helpful. I also got fc-114s, and having some troubles. As you know, it is easy to enter the AT mode, but in my case AT commands do not work. Do you have any idea about this problem? I had the same problem. When I sent whatever AT command I never got a response. But I did what Greg wrote. I pressed the button above the EN pin, on the bluetooth device. When I want to send a command I have to press that button and I hold it pressed while I send the command. That is the only way which my arduino uno and hc05 works. Thanks a lot. My issue solved by pressing the button. I assume if AT is working then you have Both NL & CR set but please double check. and ‘AT+HELP’ does not work. it is weird..hmm..
OK. You don’t have the FC-114 modules. You have a different version, possible the JY-MCU. It is also possible that you have a HC-06. Can you post a photo somewhere or link to a picture of the same device. How many pins does the module have? What markings are on the module? anyway, I found some useful tips, and I think it is working. I managed to send some data from my android phone to FC-114. I guess the manufactures are using the same break out boards for different BT modules. The boards I have all have the Boulutek firmware. The linvorV1.8 firmware is one of the standard firmwares and has been mostly found on boards like the JY-MCU. Going forward it may be better to get the firmware version first and use that rather than the model number printed on the board. 1) It takes forever for these things to generate a response. Can be almost a second to even get ‘OK’ from the AT. 2) You can’t really use a terminal program because the commands “timeout”. What I mean is, if you type A…T… (… = slow typing) you won’t get a response. 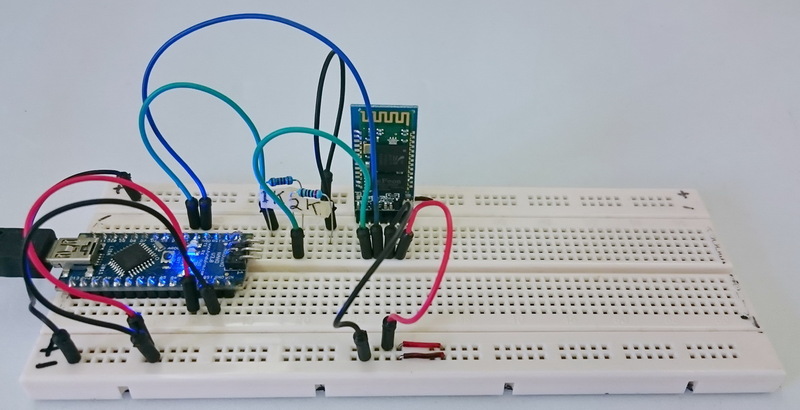 So you need to use something like the Arduino terminal or python and pyserial. This is actually what I used. Plus, my module had no button, so I had to pull up the enable (or rather, I just connected it to 5V… but really you should connect it to 3.3V). Also, most of the commands aren’t really available. I don’t know which commands ARE available, but I’ll try AT+HELP and see if that even works. About AT mode, double checked everyting, baud rate, NL & CR, tried both 9600 and 38400 baud and LED shows it is actually in AT mode by blinking once every 2 sec, i kept the button on the corner pressed before powering, to achieve that, but no AT commands work for me, not even ‘AT’ or ‘AT+VERSION’ nothing… could it be related to the button on the corner? because i read somewhere that you need to keep it always pressed. Also tried using it without touching any AT command and module seems functional, LEDs are blinking as they should and also pairing and sending data from the module to a smartphone works fine, i used Bluetooth Terminal app to test it, it is able to send data to the phone, but nothing sent from my phone reaches the module and im really confused about why is that happening if everything else seems correct. 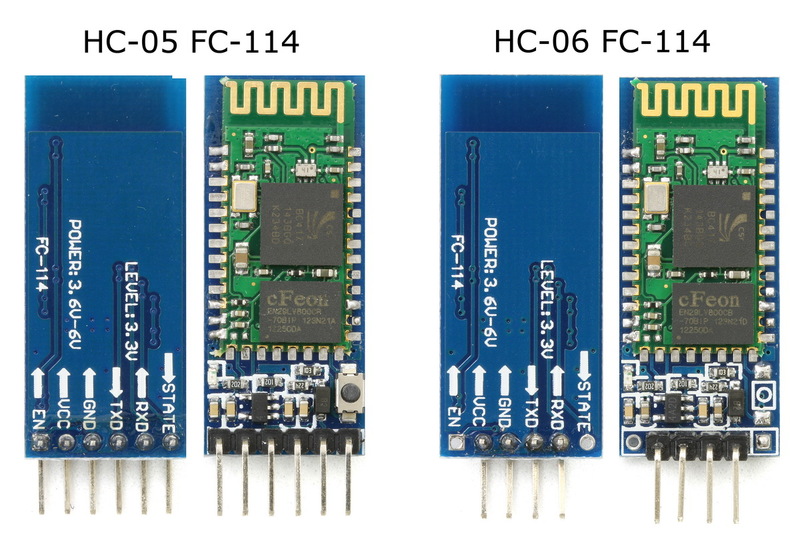 It does appear that the manufacturers are using different bluetooth modules on the same breakout board and the first step should be to try an identify the firmware. It could be Bolutek (same as me) or it could be linvorV1.8. It may even be something else. 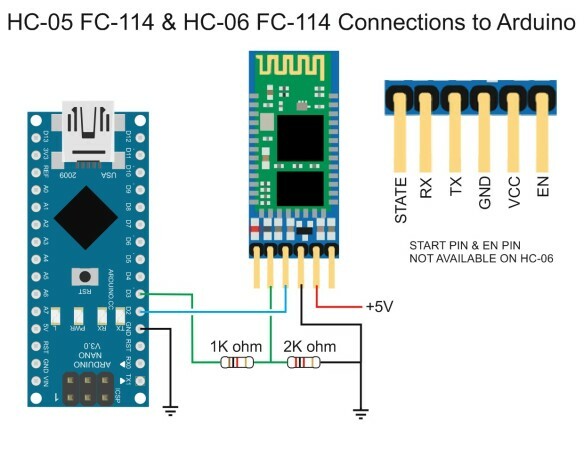 Connect the module using the above diagram and then, while connected to the Arduino, with the Arduino on and with the serial monitor open, reset the BT module (remove power, reconnect to power). You should get some kind of start up message. If you do not, change the baud rate and try again. Try 9600, 38400 and 115200. If you get garbage characters then you have the wrong baud rate. If this still does not work follow the instruction at http://www.martyncurrey.com/arduino-and-hc-06-zs-040/. This should work if you have the linvorV1.8 firmware. If you find you have the linvorV1.8 firmware then you have an HC-06 and this acts differently. What name does the module use, what name is broadcast when you pair it? If you have the Bolutek firmware (same as me) then the push button doesn’t do anything and you can use AT commands straight away. THANKS A LOT for the fast reply, i’ve tried step by step and got the following results. Pin 34 looks connected, since it clearly has solder on top. if you know anything else i could try, ill be waiting, but again thanks for the fast reply, and keep it up, your page is great and the only one that explains everything in such a detailed way. If the board was an HC-06 then I think you would have got AT to work by now (did you remember to set “No line ending” in the serial monitor?) . If pin34 in connected then you may have the 2.0-20100601 firmware. 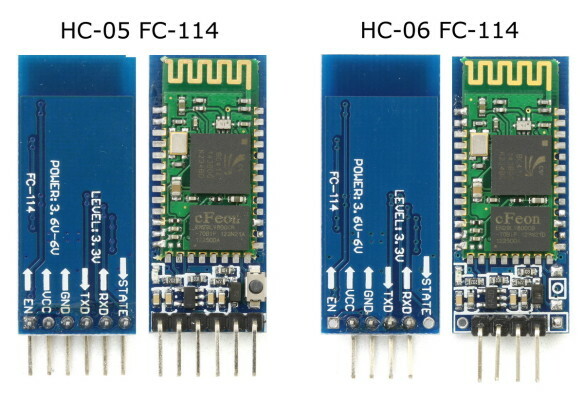 If you look at the photos of mu FC-114 boards pin 34 is not connected as it is not required. 2.0-20100601 is the firmware I have on the zs-040 boards. Have a look at http://www.martyncurrey.com/arduino-with-hc-05-bluetooth-module-in-slave-mode/ and http://www.martyncurrey.com/arduino-with-hc-05-bluetooth-module-at-mode/ see if these help. I have changed the name, but if I remember correctly, the zs-040 boards I have had the name ‘H-C-2010-06-01′ when first purchased. Do you have a usb serial adapter, something like http://www.rctech.se/index.php?route=product/product&product_id=190 (picked at random) so that you can remove the need for the Arduino and concentrate on solely on the bluetooth module? If not already a member, join the Arduino forum (http://forum.arduino.cc/). There are people on there, especially Nick_Pyner, that can also help and may have different suggestions. how can we overcome this and make the AT mode detect perfectly? when I enter an AT command, it give no response just the letters in typed in. Hello I’m using a FC-114 HC-05 the pin34 is connect. when I type “AT”, it only shows “AT”. The AT you see is from the Arduino and it seems like the BT module is not connected correctly. Check all the connections. Also check that you have “Both NL & CR” selected in the serial monitor. open the serial monitor and cycle the power to the BT module. If the BT module is connected correctly you will get a welcome message from the BT module. If you get garbage characters you have the wrong baud rate. Note that not all the BT modules have the same default baud rate and you may need to try several. The Uno should work in the same way the Nano works. Just use the same pins to make the connection. Thanx for that support .But can u specify which pins in uno. Arduino TX to BT RX. If this is not working check the connections, especially the resistors used in the voltage divider. You can also change the pins. Look at the SoftwareSerial command, you can change the pins to suit your project. If you are still having problems try different baud rates. 9600 is usually the default but yours could be different. Try 38400 first. It is also possible that you have a different firmware. Hi! I’m having issues with the 6-pin version. I connected every pin correctly, tried connecting rx through potentiometer, and both (rx and tx) signals through logic level converter, but neither of ways seems to work. 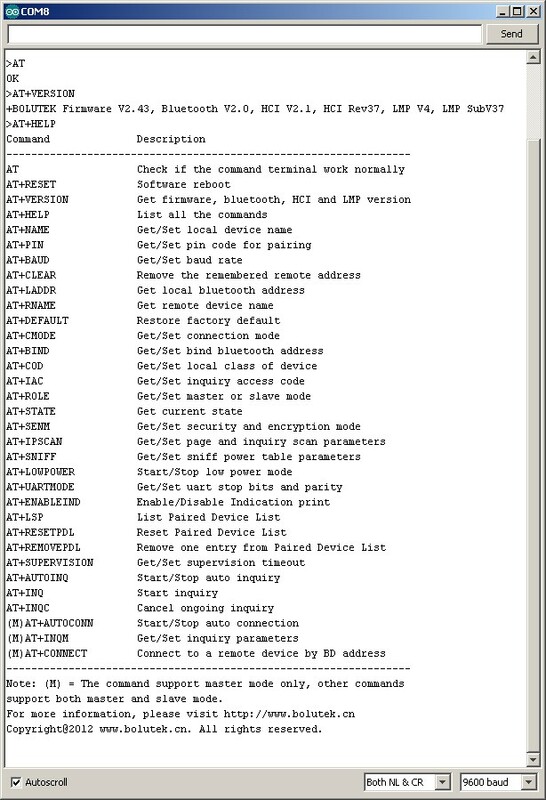 The main issue is when I send the “AT” command in serial monitor, it doesn’t return anything. 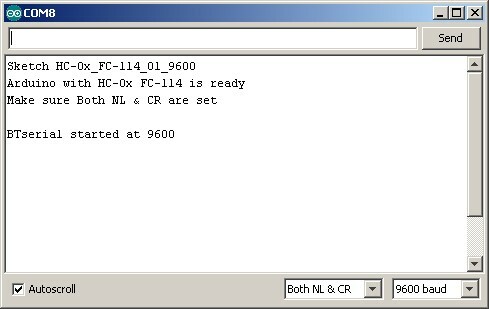 Everything in the serial monitor is set correctly, the “both NL & CR”, and 9600 baud rate. The LED is blinking repeatedly in even amounts of time. What am I doing wrong? First, triple check all the connections and see if you can get simple communication working. Try the second example from this post http://www.martyncurrey.com/arduino-with-hc-05-bluetooth-module-in-slave-mode/. It looks like the same boards have different firmwares and most work differently to the Bolutek firmware mentioned above. I am nor familiar with the Arduino101 but from what I see online it should work the same. If you have a usb-serial adapter you can use software serial and the serial monitor to confirm things are working. CODE SPECFIED IS NOT GETTING UPLOADED INTO A.UNO BOARD. The Uno should work in exactly the same way as the Nano. What errors are you getting? This is typical of a mismatch between baud rates; the rate used to open serial communication does not match the BT module. Try 38400 and if this doesn’t work try the others. Once you find the correct speed you can change the baud rate. Hi Martin, I’m using Arduino Uno with HC 05 Fc114 as well as zs 040. The small push button switch brings pin 34 HIGH. This takes you to AT mode. However, not all commands work unless you keep PIN 34 HIGH. This means keeping the button switch closed. My solution is to solder a wire to pin 34 and then connect to +3.3V when I want AT mode. And also the AT+HELP doesn’t work. Do you have a different firmware? There are now modules with different firmware. Some modules require and use line endings, other do not. It depends on the firmware your modules have. Hmm… Do you mean this? The modules I used in the above examples have a Bolutek firmware. This firmware requires line endings. The same modules can also have the linvorV1.8 firmware which does not use the line endings and so everything appears on one line. Thx for telling me these information, and what a good tutorial!